Since I don't use Tumblr, I missed this drama at first. But it's pretty awful. Long story short, a trans teenager thought the catchphrase "down with cis" was hateful and counterproductive. So he decided to make an alternative called "down with hate." What happened to him? He got harassed to the point of contemplating suicide. Maybe he and Zamii070 should start a foundation or something. So in other words, just another day on Tumblr? Radflake: Our Hate is better than the Right-Wing's hate. Our hate is JUSTICE! UWU!! ...Why does it always end up like this? Someone says "let's be nice to each other, let's stop the hate." ...And then an angry mob arrives to nail them to a tree. Some people want to hate, since it gives them a feeling of validation in their otherwise unremarkable and meaningless lives. In this case the SJWs have found a perfect opportunity for themselves. They're hateful individuals and now they've found an outlet that allows them to think their anger is righteous. So anything that would threaten to undermine that righteous anger has to be silenced. "Lets be nice to each other" threatens to take away the reason for their "righteous" anger so they have to lash out at the person saying it; even if the person they are lashing out at is one of the minority people they claim to be fighting for. Something I've noticed is that if a person of x-group doesn't agree with what's currently popular with the majority of that same group in a community (in this case, tumblr), there's a chance they'll be labeled as a "self-hating" and suffering from "internalized x-ism/x-phobia". It's actually a great way to continue trumpeting the "don't talk over x voices" stance while ignoring the same people who don't agree with them completely. Anyone who doesn't agree with them is morally repugnant because why would anyone other than the morally reprehensible not see their reasoning that is so obviously common sense? Edit: also, saying the hatred the disanfranchised feel towards the powerful is the same the powerful feel towards the disanfranchised is intellectually dishonest. But saying that it can't be harmful is also intellectually dishonest. 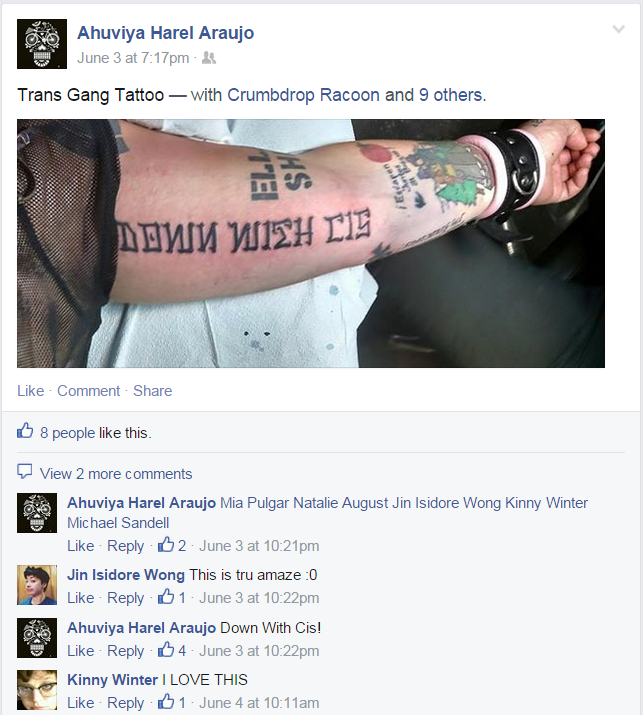 The people who go around spouting "Down with cis" are at best 17 year old transtenders and at worst delusional people who tattoo it on themselves. It's pretty sad that these guys can drown out the voices of reason by being louder. I get a feeling I might like you. It kind of looks like "Donin Wieh C15".